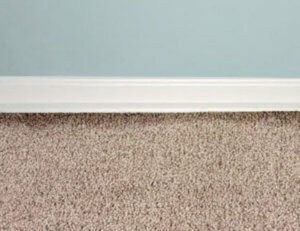 If you have light colored carpet, you may have seen and experienced dark lines that have appeared on the carpet near baseboards or doors. This soiling is called filtration soiling because it comes from air passing through the carpet as it is attempting to get through the crack between the carpet and the baseboard or under a closed door. This occurs over a significant period of time and is not noticed until a solid buildup has occurred. This type of soiling is very difficult to remove because the soil particles are so fine that they penetrate deep into the carpet fibers, sometimes into the backing of the carpet. Can it be removed by yourself? Sometimes. With special products, time and effort, reasonable results can be achieved. To help prevent filtration soiling, vacuum and wipe the edges of the carpeting on a regular basis. To achieve maximum results, call Temecula Valley Chem-Dry (951) 200-1977 or click to schedule an appointment!